In the controversy on CETA, TTIP, and the imminent trade war, politics and economics intersect. 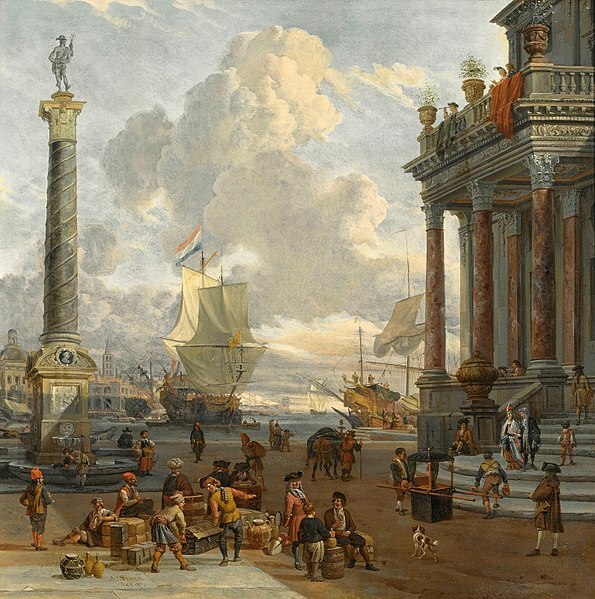 Traditional neoclassical economics treat free trade as a one-way mechanism where the welfare of all involved parties increases with trade volume. The reality however is different, argues Patrick Mokre. Many progressive economists have criticized the underlying theories – this critique forms the necessary precondition for a solidary alternative. The powerful economies of the European Union and United States seem to witness a beginning change of mind regarding international free trade accords. 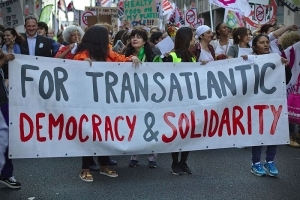 In Europe it was primarily civil society that mobilized against CETA and TTIP, above all due to the move away from democratic control represented by international investors-state dispute settlement procedures and a harmonization (i.e. relaxation) of production standards. In the United States on the other hand the right wing is currently re-erecting trade barriers due to Donald Trump’s worries that his country is disadvantaged by international accords. Before that, the last upheaval in international trade politics was the foundation of the World Trade Organization WTO. It stands for the ‘rule based trade system’, a series of treaties and political projects closely related to globalization. The legal foundation of this system is the ‘most favored nation’ (MFN) principle: A country that has been accorded most favored nation status may not be treated less advantageously than any other country with MFN status by the promising country. In principle, regulations must not favor any agent, be it firms producing under particularly high social, health or ecological standards nor trade partners from particularly disadvantaged countries. This amounts to a strategy of gradually removing all alleged or actual barriers for cross-border trade and direct investment as economist Dani Rodrik points out. There is much and legitimate criticism of this. Globalization opened the doors for privatization and the removal of workers’ rights in many countries, especially of the global South. In 2016, even an International Monetary Fund essay concluded that deregulation and privatization produced smaller than expected economic growth, but aggravated inequality and jeopardized sustainable growth. Have leftist critics of globalization and the nationalist US president found common ground? This superficial analysis is problematic beyond it blurring important differences. It is a classical trap of over-simplification for which dominant economic theory is responsible. Questions of international trade are neither obvious nor one-dimensional. Questions of trade and exchange in capitalism are essential enough to be part of a popular name for the existing economic system: market economy. Starting with the classical political economics school, authors put that concept at the heart of their theory. David Ricardo’s trade model is often argued to be the centerpiece of his work. Most of Adam Smith’s writings build upon the insight that increasing division of labor fosters efficiency and growth. This principle also applies to international trade. However, a second important effect of national markets is explicitly not transferred to the international stage: The principle of the strong pushing out the weak in competition. Ricardo’s model makes that clear when he argues that the principle of production cost pricing applies within national borders, but not on the world market. There, nations divide global production at no one’s loss according to the principle of comparative advantage, instead of more efficient producers accumulating market shares. The modern, neoclassical version of Ricardo’s ideas is the Heckscher-Ohlin model, in which there are no cost differences between firms (or nations) to begin with. However, even the remaining implications of intensified competition disappear in this model as soon as the global market is entered. Instead, unregulated competition and balances of payments are supposed to automatically equalize balances of trade. The subsequent (assumed) eradication of trade imbalances implies an automatic ‘catching-up’ of countries initially producing at less favorable factor ratios, like economist Thomas Friedman believes. Progressive economists, for example Anwar Shaikh, remove the distinction between national and international markets while arguing that on the global stage it is also firms, not nations, competing. He emphasizes that within a country just as much as between countries, unregulated competition leads to stronger firms seizing larger market shares. If in one country many firms produce cheaper than in another one this would imply a lasting trade deficit for the second nation. Instead of assuming that balances of payment automatically equalize trade balances, the importing countries would persistently borrow money. The consequences are lasting trade deficits and debt traps. These dynamics can also be observed statistically, balanced trade is the exception rather than a rule. This is because international trade does not work like the laws of automatic harmonization in textbook examples suggest. Gains in efficiency can be a result of trade, which opens the question of distributing the resulting wealth. Lower tariffs and capital controls make it easier for firms to outsource production and still sell on domestic markets. When firms do this, they often claim wages or secondary wage costs as reasons. Tariffs and regulations play a dual role in this context. On the one hand, they are a steering mechanism of the state against firms, just like taxes and legal standards are in domestic production. A gradual removal of these subsequently decreases the bargaining power against firms. Furthermore, largely customs-free trade and removal of capital controls make outsourcing with remaining market access to domestic demand less costly. This can lead to a downwards spiral in taxes and regulations when states pit against each other. The same dynamic applies to wages, when workers have the choice between lower compensation or job loss due to outsourcing forced upon them. In any case, the balance of power shifts away from workers and towards firms. This decreases the chances for a distribution of profits that is desirable for workers, for example via a strong social welfare system or higher wages. One reason is that companies can act transnationally with relative ease while social welfare systems remain bound to the nation state in almost all cases. This also implies a shift in functional income distribution away from labor and towards capital income. One consequence of this can be lower demand for consumption goods, which is a barrier to sustainable growth. This is one reason why studies on free trade agreements find low or even negative effects on growth: distribution and growth are closely related. Economists and politicians like to prescribe the removal of trade barriers as one, or even the only, path out of the poverty trap for developing countries. But if the findings from the over-simplified model, lower trade barriers implying balanced growth and welfare, do not hold, the opposite can be the case. Persistent dependencies and loss of resources are problems that have been at the core of the critique of globalization. History shows that the most powerful now developed countries did not reach the apex of international competition by unregulated trade. Economic historian Ha-Joon Chang argues that both England and the United States developed towards competitiveness behind high barriers of tariffs and protectionism. This was a targeted and explicit policy of infant industry protection. Ironically, it is these countries in particular who ‘prescribe’ deregulation and opening to international markets to developing countries. Chang calls this “Do what I say, not what I do”, or even “kicking away the ladder by which one has climbed up”. For effective developmental policies, more is needed than mere formulaic affirmations of free trade and hopes that the market will balance income inequalities. Trade policy is unable to achieve that, since such an automatic relationship does not exist. 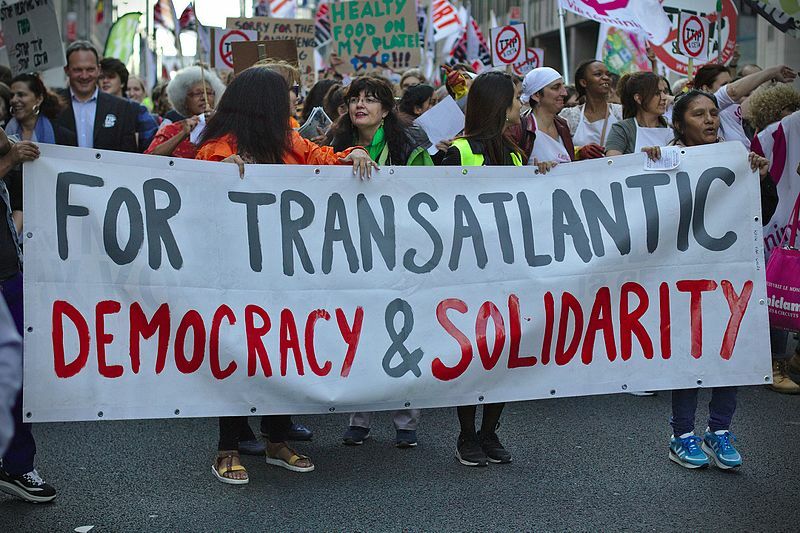 Instead, economic policies of international solidarity and with a focus on workers and social rights, targeted industrial policies and a transnational cooperation of the workers’ movement are necessary. Economic debates about international trade and corresponding treaties are often based on economic models which assume away important aspects. Actually, neither statistical investigations nor historical analysis indicate that there should be any direct link between unregulated trade, growth, and welfare. A progressive alternative to this paradigm has to start with translating not only efficiency gains, but also dynamics of competition to the international level. Furthermore, it is essential to consider more variables of interest than only the relatively abstract trade volume: real wages, employment and income distribution should be at the center. This provides the basis for an analysis of the negative consequences of globalization, such as debt traps, persistent inequalities between countries, and between wage and capital income. It is necessary to acknowledge what unregulated trade can and cannot achieve. For industrial, social and distributional policies at least additional elements are necessary. A further removal of alleged and actually existing trade barriers might have no or even negative results. It is in the interest of workers to reconstruct these policies based on international solidarity and transnational cooperation. Patrick Mokre is a graduate student of Economics at The New School in New York. This article was first published in German on the Arbeit & Wirtschaft Blog.